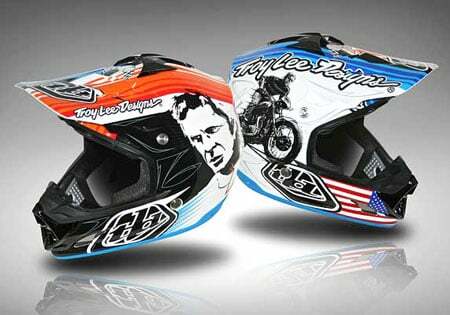 Troy Lee Designs is producing a new limited edition motocross helmet in tribute of Hollywood legend Steve McQueen. The star of such films as “The Great Escape”, “The Getaway” and “Bullitt”, McQueen also appeared in and helped financed the Academy Award-nominated documentary “On Any Sunday”. McQueen was an avid motorcycle racer, competing in the Baja 1000 and representing the United States in the 1964 International Six Day Trial. The Motorcycle Hall of Fame inducted McQueen in 1999.